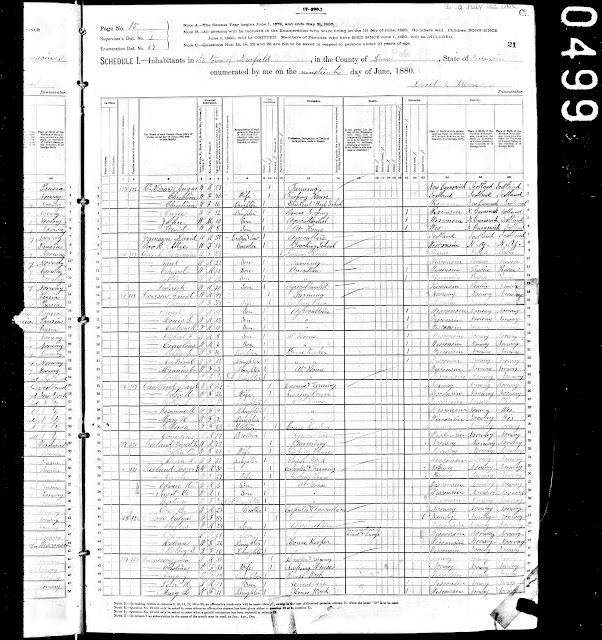 1880 United States Federal Census, Dane County, Wisconsin, Deerfield Township, Enumeration District 67, Page 21C (stamped), Dwelling #117, Family #120, Sivert T. Leeland household; digital image, Ancestry.com (http://www.ancestry.com : accessed 25 July 2009), citing National Archives Microfilm Publication T9, Roll 1421. 1880 United States Federal Census, Dane County, Wisconsin, Deerfield Township, Enumeration District 67, Page 21C (stamped), Dwelling #117, Family #121; online database, Ancestry.com (http://www.ancestry.com : accessed 25 July 2009), citing National Archives Microfilm Publication T9, Roll 142. These two families resided in the same house. Torger S. Leeland (Torger Sjursen Leland) is the son of Sivert T. Leeland (Sjur Torgersen Leland) and Britha O. Leeland (Britha Olsdtr Leland). The wife of Torger S. Leeland is Anna Leeland (Anna Ellingsdtr (Natvig) Leland), daughter of Elling Natvig and Anna Ellingsdtr Natvig. Torger Sjursen Leland (1850-1933) and Anna Ellingsdtr (Natvig) Leland (1853-1911) are the great-grandparents of Linda (Leland) Seaver, and she is descended through their son Sivert O. Leland (1878-1940). By 1880, most of the Norwegian families in Dane County had selected a permanent surname rather than the patronymics used until the 1870s. In this case, the Lelands chose a farm name (anglicized from Liland farm) to the west of Voss in Hordaland in Norway.